When I arrived at Regina Street Alternative School to interview community volunteer Barb Smith, Chouy Johnston, the office administrator, pulled out a personalized “Grandma Barb” nametag, in anticipation of Barb’s arrival. I was impressed with this thoughtful gesture, and Chouy explained that she makes special nametags for all Regina’s volunteers. The Ottawa Network for Education has recruited, screened and placed about 100 community volunteers in Regina Street School over the past two decades. The school currently welcomes the Rotary Club of Ottawa West, whose club members volunteer to read aloud to primary students weekly as part of the OttawaReads program. In addition to the Rotary Club volunteers, about a dozen individuals volunteer weekly in several classrooms assisting teachers where needed. 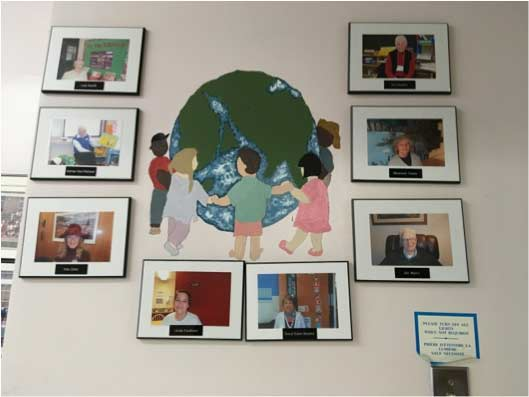 Regina Street School has not one, but two school walls dedicated to featuring Regina’s community volunteers! These thoughtful gestures earn Regina a reputation in the community of being ‘volunteer friendly’. Grandma Barb is a unique volunteer with a unique volunteer position. 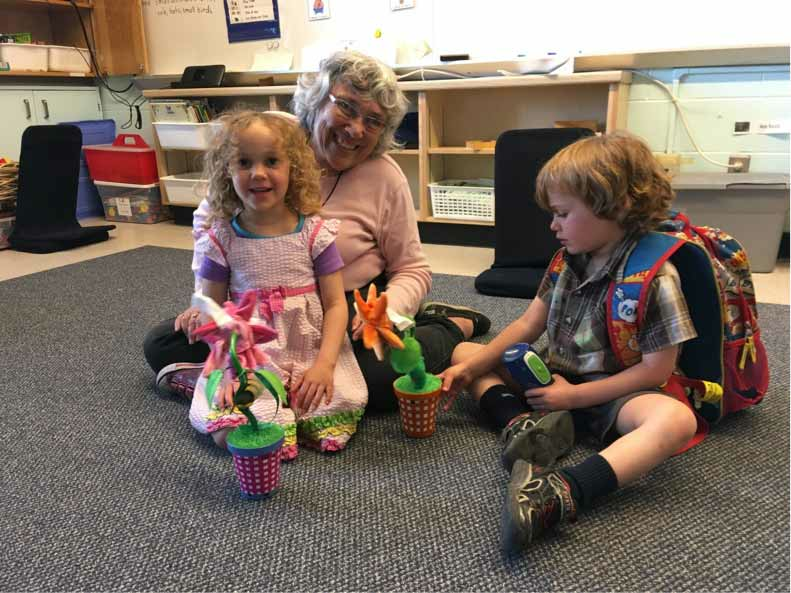 She volunteers weekly in her grandson’s grade 4/5 class helping with literacy and music, and then teaches Music and Movement in her twin grandchildren’s Kindergarten class. This high energy class gets the children laughing and playing while they learn new songs and movements. Barb teaches the children American Sign Language as part of her music class along with rhythm, rhyme, and timing. Barb has a lifelong love of educating children. She holds an Ontario Elementary Teaching Certificate and an Ontario Early Childhood Educator equivalent Teachers Certificate, making her qualified to teach children from kindergarten to grade 10. For many years, Barb was also a licensed Kindermusik Educator. She worked as a Parent Pre-school Coordinator for Tots and Toys, a Pre-school Toy lending library programme in Ottawa West, and she was a Crescendo Programme Coordinator for Pinecrest Queensway Health and Community Services for 13 years. Barb offered music and movement classes in summer camps at Foster Farm Community Centre and sometimes at other locations. And retirement has not slowed her down! Barb recently helped the grade 4/5 students understand the importance of owl conservation by linking a book they were reading to a real event in Ottawa. “The students in one of the grade 4/5 classes at Regina were reading “Owls in the Family”. In the book, an owl’s nest is blown out of a tree during a storm. In April this year, an ice storm hit Ottawa and surrounding areas causing a lot of damage. Some ice hit an owl’s nest on Petrie Island knocking the mother owl unconscious. Luckily, people came to the rescue and rescued the mother and her two babies. Mummy owl had a concussion from this event and the family was sent to The Owl Foundation in Vineland, Ontario. Thank you, Grandma Barb, for enriching the lives of everyone at Regina! Barb Smith was screened through the Ottawa Network for Education (ONFE) to volunteer in OCDSB schools. The Ottawa Volunteers in Education/OttawaReads Program, more than 1,500 community members are volunteering over 206,784 hours in 152 local schools to support over 58,850 students annually – a donated value of over 4 million dollars! Learn more about how to become a volunteer.